The Kitsap County Sheriff’s Office has a new member, of the four-legged variety. 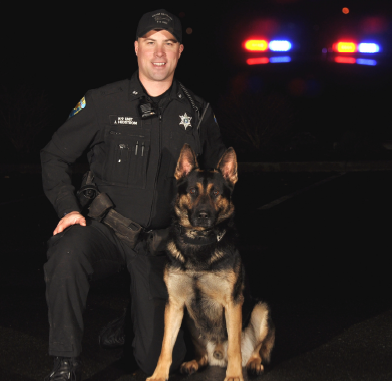 Titan, a two-year-old German shepherd, has officially signed into service as a tracking dog and is partnered up with Kitsap County Sheriff’s Deputy Joe Hedstrom. Bringing Titan into the office would not have been possible without a $5,000 donation from the Peninsula Dog Fancier’s Club of Kitsap County, deputies said in a news release. The dog was born in Germany in 2010 and imported to America in the summer, through Von Grunheide Shepherds of Snohomish. Hedstrom is no stranger to K-9 handling. He partnered with and trained Ajax, a German shepherd who worked the beat four years amassing 112 captures. But a neck injury forced Ajax to retire early. He now lives at Hedstrom’s home. Wow! What a beautiful dog!